Something I’ve learned about myself is that I rarely turn down an opportunity for adventure. 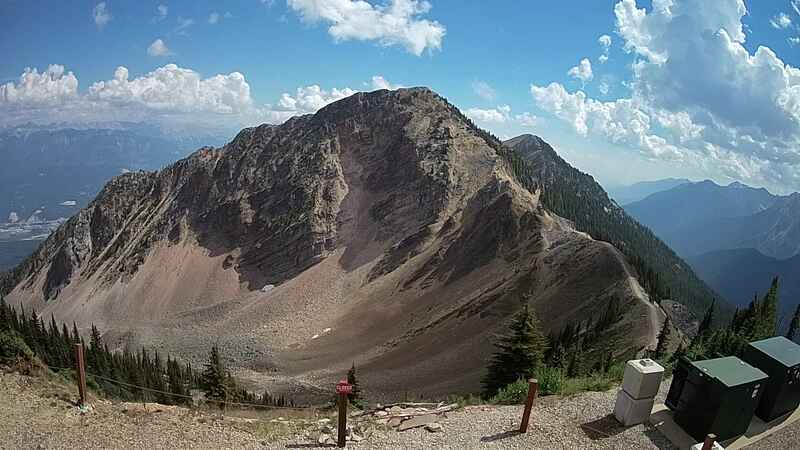 When Kicking Horse Mountain called and wanted me to climb ‘Terminator Peak’ and cross a swaying suspension bridge, I answered. I have never done much climbing. I mean, I have climbed mountains and bagged a couple summits; but this was no ordinary climb. 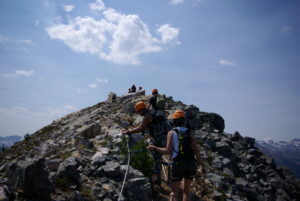 This type of climb is called “Via Ferrata” which means “iron path” in Italian. 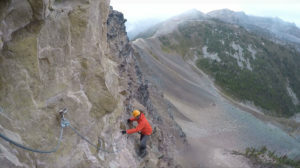 I have done this type of climb only before but our route for this trip is positioned as “The Most Exhilarating Via Ferrata in Western Canada” and we were heading to the summit of Kicking Horse Mountain. Before we began climbing everyone goes through a short but informative training session on how to use the climbing gear. Via Ferrata climbing is a little different than normal rock climbing in that you are always harnessed in but have to be responsible for your own technique up the mountain. It is simple stuff, you just have to be conscious and aware – which isn’t tough because when you’re up there, you are 100% involved in what you’re doing. No distractions; my mind was fully focused on the task. 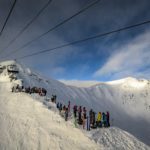 It didn’t take long for all of us to get comfortable with the provided gear so we started out by trekking the ridgeline high above Kicking Horse and the town of Golden, BC. After a short hike you arrive at the swaying suspension bridge… No matter how many times I’ve been on these types of bridges I still get swept by a wave of excitement. 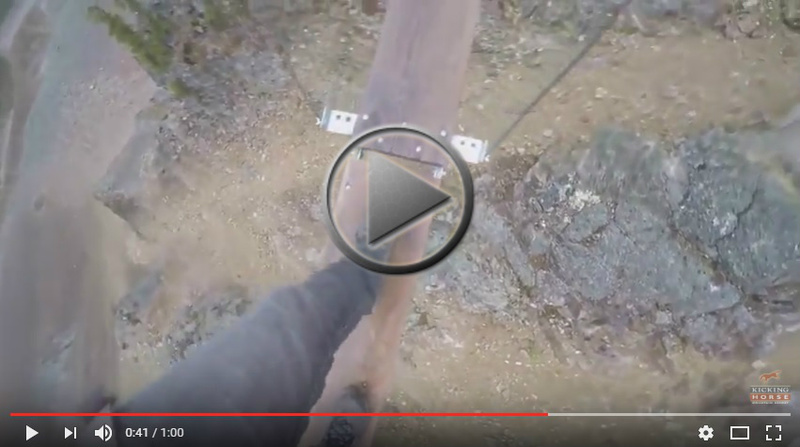 Step by step I crossed the wooden planks as the bridge swung from side to side. One thing to keep in mind is you are literally safe all the time, and you are harnessed into cables that are bolted into the mountain. As we climbed onward and upward we were able to take short breaks to chat with one another, watch others and their technique, take photos of each other (obviously selfies) and get to know one another. Honestly, I thought more people would be freaked out but our entire group was comfortable, laughing and we all became friends within the first hour. There were even kids with us and they were doing great! One thing I noticed from the youth with us was they were HAPPY. Like, genuinely. It was pure adventure to them and it was wonderful to hang out with some young people who enjoyed the outdoors. Speaking of people who enjoy (or live for) the outdoors – our guide Jackie wasn’t just a guide, she became our friends. Jackie O is as fun as they come. Jackie (or any Guides) can be instrumental in any activity or trip in the mountains, and she never let us go forward with doubt. She was super supportive, skilled, had a fun-cheeky attitude and ultimately had a positive outlook on life and adventure. This route up the mountain was called the Ascension route and takes 4.0 hours to complete. After the morning of climbing we all peaked the summit and had some time to give high-fives and at this stage we were all hugging each other in joy. I won’t ever forget it. 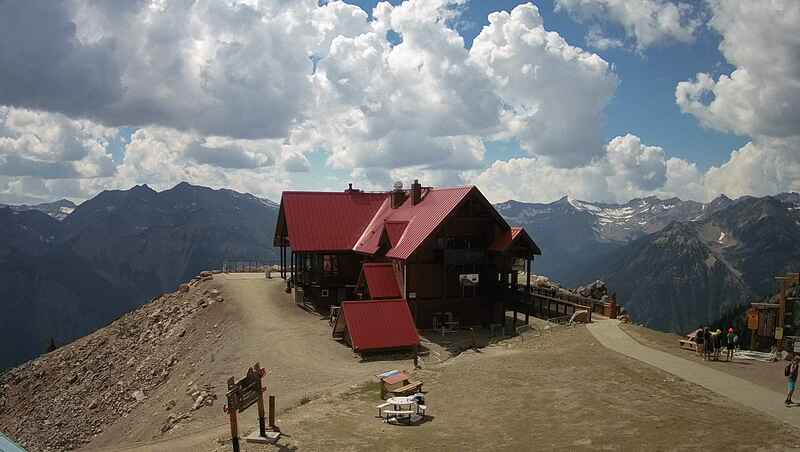 For me, this activity is high on my list for exhilarating mountain fun that just about anyone can do. My sense of excitement was non-stop all the way up to the summit. I can’t wait to climb it again – see you up on the suspension bridge this season! 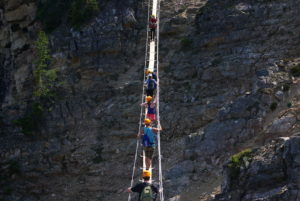 Learn more about Kicking Horse Mountain’s Via Ferrata climb here. Ever looked up at the mountains and thought you should drop everything and live there? Well, stop waiting and jump into a new adventure with us! 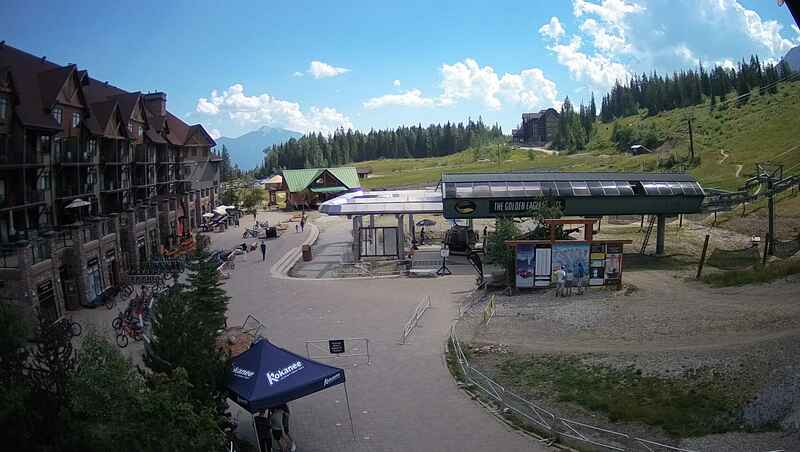 Make the beautiful scenery of Kicking Horse Mountain Resort your office full time office. 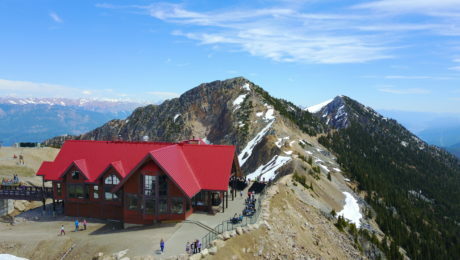 The Eagle’s Eye Restaurant, located at the summit of the resort, is the highest restaurant in Canada. We are currently hiring for both Kitchen & Front of House staff. 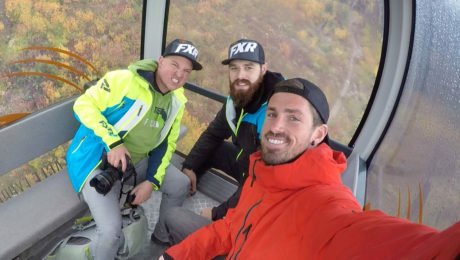 Your morning commute is a 15 minute Gondola ride, that will elevate you to 7’700ft, with 360 degree views of some of the most stunning landscapes that Canada has to offer. Work with a likeminded, high energy, passionate team of people that came here to live the dream. 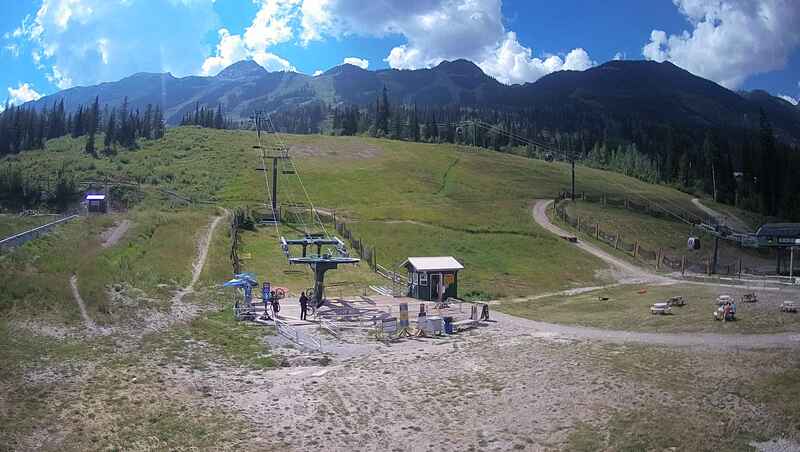 Working at Kicking Horse Mountain Resort comes with great advantages including free access to our lifts for hiking, biking, and visiting the grizzly bear, discounts in local restaurants & shops, reciprocal discounts to other mountains in BC, and more! Visit our employment page (find link below) to view details & positions available. Fire us your resume and we’ll get back to you shortly. 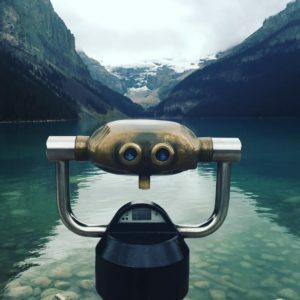 Stop waiting and start living your dream now! Meanwhile, catch us on the trails… if you can! We woke up, peeled back the blinds to a foggy interior BC morning. I loved it. The beauty of the fog rolling through the ancient trees and over the Canadian Rockies was breath taking. 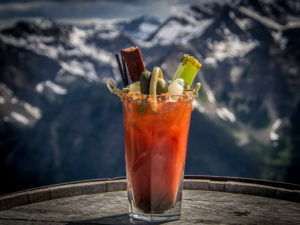 We packed up the truck and headed for Kicking Horse Mountain Resort, well… first a coffee, and then headed for Kicking Horse. As we drove up the winding road to the resort I got a little nervous. There were a few butterflies hammering around in my stomach, but nothing out of the usual. 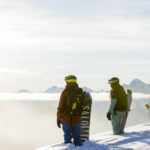 I get so stoked every time we pull up to rad resorts like Kicking Horse Mountain Resort – you know good things are to come. We had roped ourselves into the ‘Via Ferrata’. This all started when we saw pictures online of people climbing epic routes up monster faces, and apparently anyone can do it… so we got on the horn and lined it up. Tell you the truth, we had to google what that the name even meant. Via Ferrata is Italian for “iron road”, often associated with helping move troops in the First World War through the Dolomite mountain range of Italy. 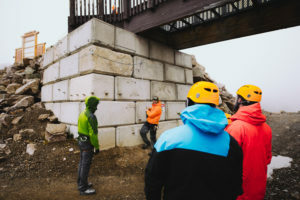 It was designed to help those who had no climbing experience to be able to navigate those rocky climbs. Climbers secure themselves to a cable, limiting any fall. 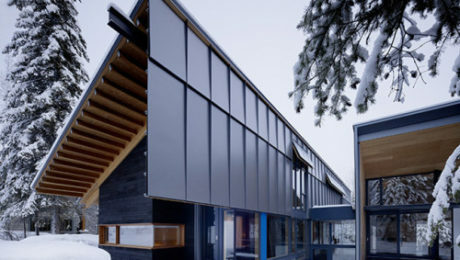 Along with the cable, additional climbing aids are provided, such as iron rungs (stemples), pegs, carved steps and even ladders and bridges are provided. This sounded unreal, we couldn’t wait. Making our way to the Via Ferrata we walked along this amazing ridge at the top of Kicking Horse. Clouds parted and the sun came out, revealing an absolutely epic view of a thousand surrounding mountains came into view. We all stopped, it was entrancing. After a few photos and necessary selfies we carried on. At the entrance to the Via Ferrata we slide our carabiners onto the cable. Game time. First was the suspension bridge, ‘Hanging Glory’. With merely two 2×6’s underneath you and two cables to steady yourself we made our way from one ridge to another… the ground was a long way down. It was thrilling. Our team moved on to climb the route starting small but soon making our way to the mammoth 465 meter rock face. The steel rungs definitely make this route accessible for everyone, it was incredible how easy this made climbing. This style of climbing allowed us to access a spot we never thought we could get to, and we did it safely. Halfway up we were already making plans to come back and do this again. As we we neared the middle of the climb we paused, it felt like we were in a movie. We were halfway up this wild, iconic route I never thought of tackling, sitting on the face of this massive peak. We felt pretty badass. 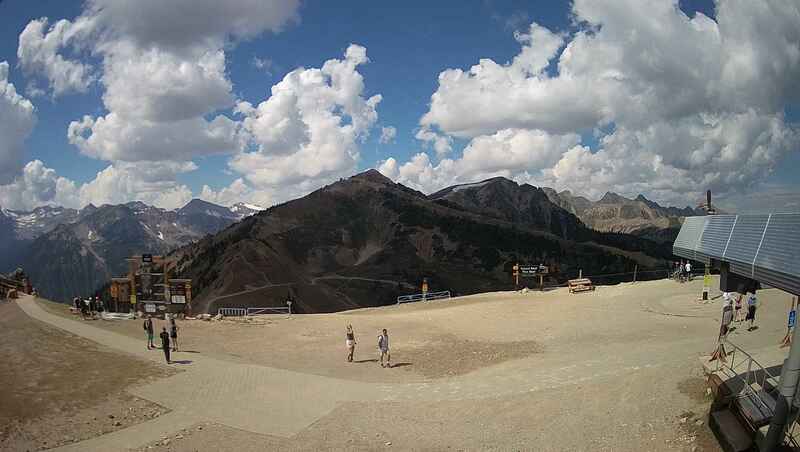 As we reached the top we were all exhilarated – sweating, catching our breath, high fiving and hugging. Our team had pushed through pre-conceived notions of fear and physical ability to prove to themselves they were capable of more. 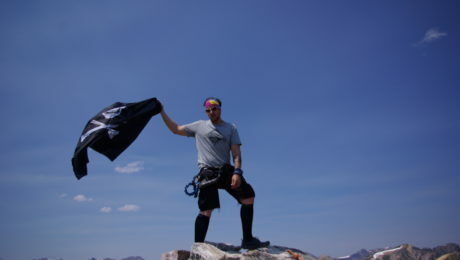 The feeling of accomplishment as we summited the peak was incredible. 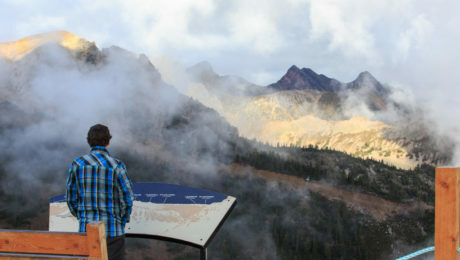 We all stood there in awe taking in our triumph as we enjoyed the view from the top. 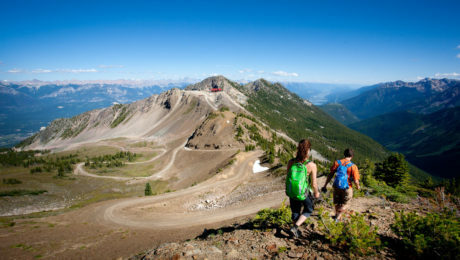 This summer step out of your comfort zone and experience first-hand exposure in a safe environment, while soaking in the majestic views of the Rockies and Kicking Horse Mountain Resort. 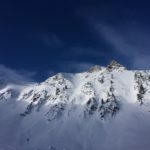 The experienced and friendly guides will cater to your level, whether you are a lead climber or a never-ever in search of an adrenaline fix. 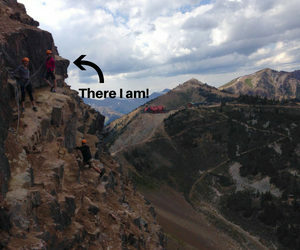 I highly recommend that adventurers of all ages try your hand at the Via Ferrata. It’s snack time for Boo the Bear. Ross Prather approaches with a bucket of fish carcasses and kitchen compost. It’s a hot summer’s day and Boo has found a shady spot among the fir trees to laze away the afternoon. However the scent of a snack gets his attention; a grizzly’s sense of smell is so acute it can detect an animal carcass more than 30 kms away upwind. Under normal circumstances such proximity would be perilous – man with bucket of food, hungry 275 kg grizzly bear steps away – if it wasn’t for the electric fence separating the two. 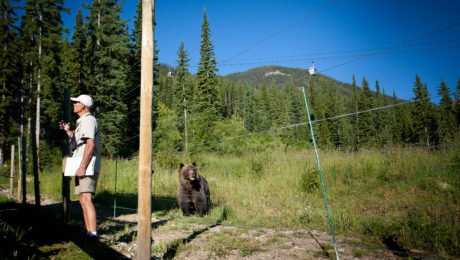 Boo the Bear has made his home at Kicking Horse Grizzly Bear Interpretive Centre since first arriving in 2003, when he was orphaned after his mother was shot by a poacher. Over the years Prather, refuge manager, has gotten to know this wise old bear well. 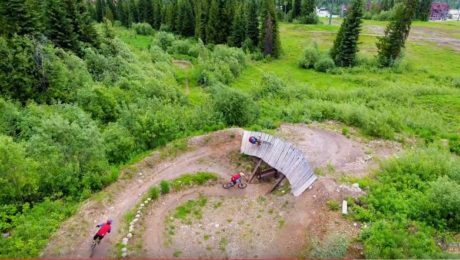 The specially built, 10-hectare fenced enclosure, found on the Eagle Express Gondola lift line and accessed in summer via the Catamount chairlift, provides a natural habitat for Boo, with forest, meadows and a running stream. Ursus arctos horribilis – the grizzly’s Latin name is enough to strike fear into the hearts of even the most seasoned wilderness traveler. 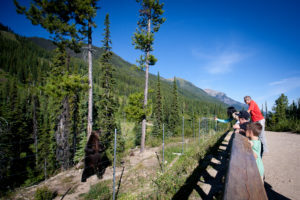 However the opportunity to observe this animal up close is a thrilling experience, enabling visitors like my family and I to better understand grizzly behavior and ecology with the help of Prather and his staff. At times Boo stays deep within the confines of his enclosure, perhaps eating dandelions and digging for springtime bulbs in a meadow, or hunting for squirrel or marmots. However when curiosity gets the best of him, or the dinner bell rings, he approaches the fence. We’re lucky today. Boo lumbers out of the forest, snout pointing upward, his powerful shoulders rippling, lustrous silver-brown fir gleaming in the sun. It’ hard to overcome the urge to retreat as Boo comes close, but the fence keeps us safe. 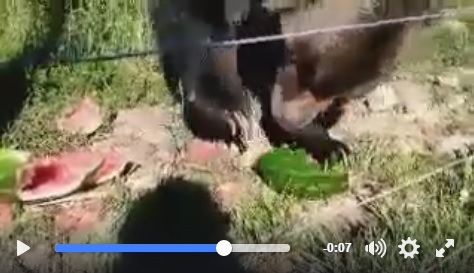 Watch Boo devour a watermelon! 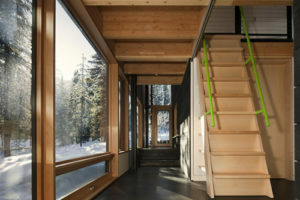 A male grizzly typically ranges a territory of between 350 and 800 square kms, but Boo seems content with his home at Kicking Horse Resort – for the most part. Occasionally his urge has gotten the best of him. “Boo gets a little randy in springtime,” Prather says, adding that he has left his enclosure a few times in the past in search of a mate. However he always comes back. Meal time is over. A horsefly buzzes courageously nearby and Boo shakes his massive head. Oblivious to my family and I observing from a few metres away, he strides the fence line before angling back into the forest and finding a nice muddy pool in which to cool himself. He lowers into the brown water, rolls from side to side, then emerges again, fir dripping with water, then disappears into the cool of the forest. Life is good for Boo and we’re thrilled to share a few moments with him. 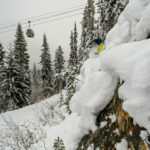 Disclaimer – Andrew visited Kicking Horse Mountain Resort to see Boo in 2016, Ross has since left his position with Nicole Gangnon taking over as Grizzly Bear Ranger Manager. 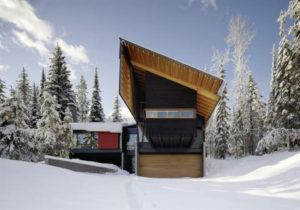 Visit Kicking Horse this winter to see Nicole and her team caring for Boo.